For the past couple of months, I had to live with malfunctioning AirPods. As I noted on the Connected podcast a few weeks ago, I started noticing the first problems with battery life: when my AirPods were new and well into their first year of usage, I could listen to an entire episode of Upgrade or Cortex (usually around 90 minutes) without hearing the AirPods' dreaded low-battery chime; earlier this year, one of the AirPods (the right one) couldn't even survive 30 minutes of podcast listening without warning me that its battery would be depleted soon. Then the problem got worse: a few weeks ago, my original AirPods (which I bought as soon as they came out in December 2016) began randomly disconnecting from the iPhone while working out and listening to podcasts or music; upon reconnecting them, the right AirPod would simply refuse to play audio or it would play at an extremely low volume. Eventually, I accepted the fact that my AirPods had been used too much over their two-year life and that, like others, I just had to wait for new ones. I had to work out while wearing large over-ear Sony headphones which, let me tell you, were not designed for high-intensity interval training. It was, to put it mildly, unpleasant. There isn't much to say about the physical appearance of the second-generation AirPods, which I ordered as soon as Apple sneakily announced them via a press release last week. The AirPods themselves look the same as the first-generation model; the case, which I bought in the wireless charging flavor, features a tiny LED indicator to communicate charging and pairing status on the outside – effectively, the only visible difference from the original AirPods case. What I did notice in my first 24 hours with the new AirPods is how much I was missing the pristine AirPods experience; at the same time, I've also begun to appreciate the newly added convenience granted by further cutting the wires that tie AirPods to the iPhone – both physically and conceptually. The first thing I realized while listening to my workout mix is that my old AirPods haven't been playing audio at full volume for quite some time. These new AirPods are loud, but not because they're actually louder than the first-generation model – I believe it's because my old AirPods hadn't been operating at full capacity without me knowing for a while. For this reason, audio quality on the second-generation AirPods feels like a considerable upgrade, even though on paper it's not; once again, I'm impressed by the sound Apple was able to pack in such a tiny and inconspicuous design. I don't consider AirPods a comparable alternative to my favorite over-ear headphones, but they continue to perform better than some sports-oriented earbuds I tried in the past, and using the second-generation model reminded me of this. Of course, some are already debating whether or not the new AirPods sound better than the old ones; my first reaction is that they seem to sound "better" because the old ones had slowly degraded in quality over time.1 Which I guess is something that just naturally happens when you're dealing with such small lithium-ion batteries. I'm okay with the progressive degradation of my original AirPods given how much I've used them every single day, in cold and hot weather, while exercising or doing chores around the house, since December 2016. Where the new AirPods objectively sound better than the old ones is Siri. On the original AirPods, invoking Siri (either with a gesture or by summoning 'Hey Siri' on a paired iPhone) usually involved a small delay and the assistant's voice was robotic and low-quality. Siri on the original AirPods sounded like it was coming through FM radio. It was not a good experience, and a far cry from the human-sounding voice of Siri on iOS 12 and the HomePod. 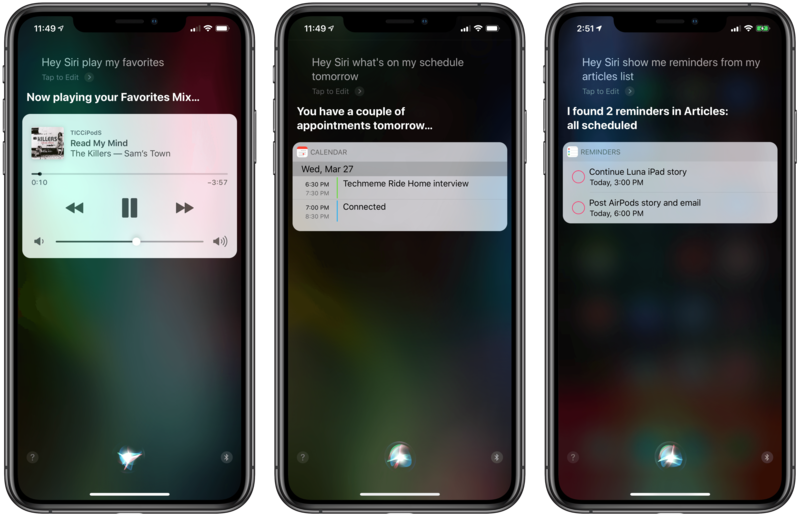 The second-generation AirPods natively support 'Hey Siri', which means that activation is instant and Siri's voice is crystal clear, just like on the iPhone. For the first time since Apple launched AirPods in late 2016, it feels like Siri itself, not a poorly streamed version of it, is in your ears. Thanks to these improvements, Siri becomes a fundamental part of wearing AirPods, and I'm already witnessing a shift in my behavior when it comes to asking questions that require a response from the assistant. Since yesterday, I've been using Siri to play songs from Apple Music, log glasses of water through my hydration shortcut, check my agenda in Reminders, and start workouts on the Apple Watch. All of these actions were supported before with the original AirPods, but on the new ones Siri is faster and feels more integrated with the product itself; it is more comfortable to use and engage in a conversation with – and the comfort of the user experience is something I noted about the Apple ecosystem before. By adding 'Hey Siri' support to the new AirPods and enhancing the assistant's sound quality, the new AirPods feel more independent from the iPhone; because I no longer begrudge the inferior sound quality of Siri in my AirPods, I can use 'Hey Siri' more often knowing that the voice in my ears isn't any worse than the "real Siri" on the iPhone.2 The improved voice quality of Siri creates the illusion that the entire Siri service lives inside the AirPods while, in reality, you're still streaming its voice from a nearby iPhone.3 Not to mention how, thanks to the improved beamforming microphones in the new AirPods, giving commands to Siri also seems more accurate than before, resulting in fewer iPhone pickups to fix what 'Hey Siri' got wrong. 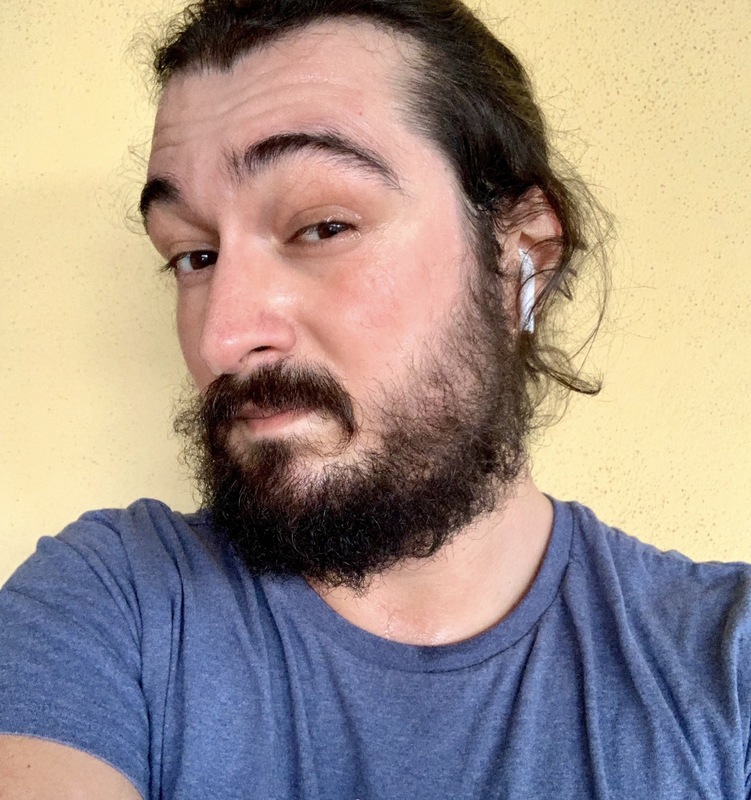 It feels great to work out with AirPods again. I especially love controlling music and podcast playback exclusively with my voice. Speaking of freedom from the iPhone, the addition of wireless charging to the AirPods case also plays into this feeling of owning two small wearable computers that no longer live by the iPhone's rules. In the two years since Apple added wireless charging to the iPhone line, my girlfriend and I have scattered a variety of wireless charging mats around our apartment. Each of us has one on the nightstand; we have a Samsung charger in the hallway; we have one in the kitchen; and, I recently added this one on top of the "foot" of the LG UltraFine 4K display at my desk. The more we can remove Lightning wires dangling off our furniture, the better – especially with two playful dogs who just love to chew on them when we're not looking. But with the old AirPods, we still had to keep at least one Lightning cable around to top off the case, and as a result we often ended up plugging our iPhones in too out of laziness. We had to keep that Lightning cable around anyway, so why not? With the new AirPods and their wireless charging case, we can finally say goodbye to that lone Lightning cable plugged into a USB charging dock and take advantage of all the wireless chargers we've disseminated throughout our house. It may be a trivial improvement, but it's nice not to have to keep "the iPhone cable" around anymore, and the AirPods lifestyle is, in my opinion, all about small niceties that are seemingly unnecessary, yet obvious once you get used to them. 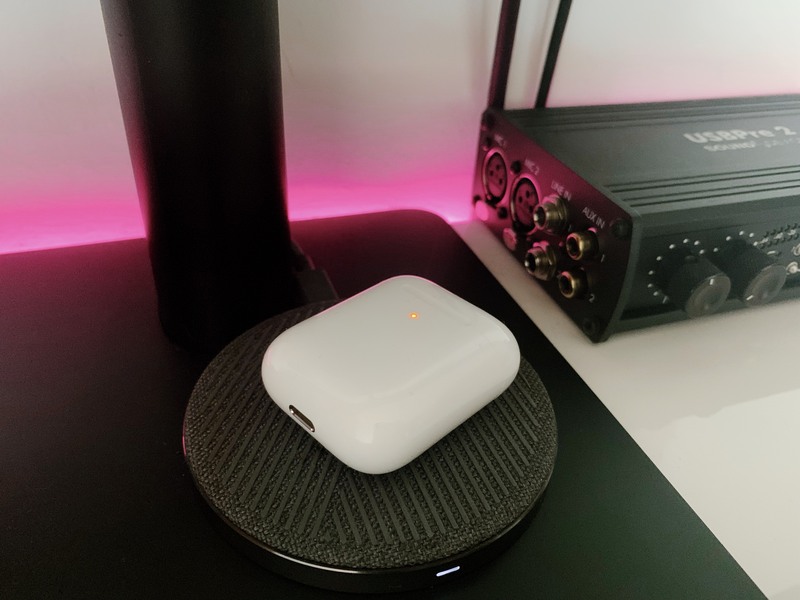 There's nothing to set up, no additional steps to consider: you just place the AirPods' case on any Qi charger, the LED indicator lights up, and it starts charging.4 It's a small increment of freedom that feels natural and user-friendly. The next logical step, of course, would be a wireless charger that lets you place any Apple device on top of it to charge it; to paraphrase what Robert Smith once said, it is the hope of all that might have been that fills me with the hope to wish impossible things. Lastly, as I noted in my Instagram stories yesterday5, I ought to mention how the new H1 chip in the second-generation AirPods vastly improves connection times with faster speeds when switching AirPods between different Apple devices. Where the old AirPods used to take well over 5 seconds (and usually around 10, especially on the Mac) to switch as the active headphones between the iPhone, iPad Pro, or Mac mini, the second-generation AirPods can switch between devices/platforms in 2-3 seconds thanks to their improved wireless architecture. It's downright remarkable how fast the new connection is. 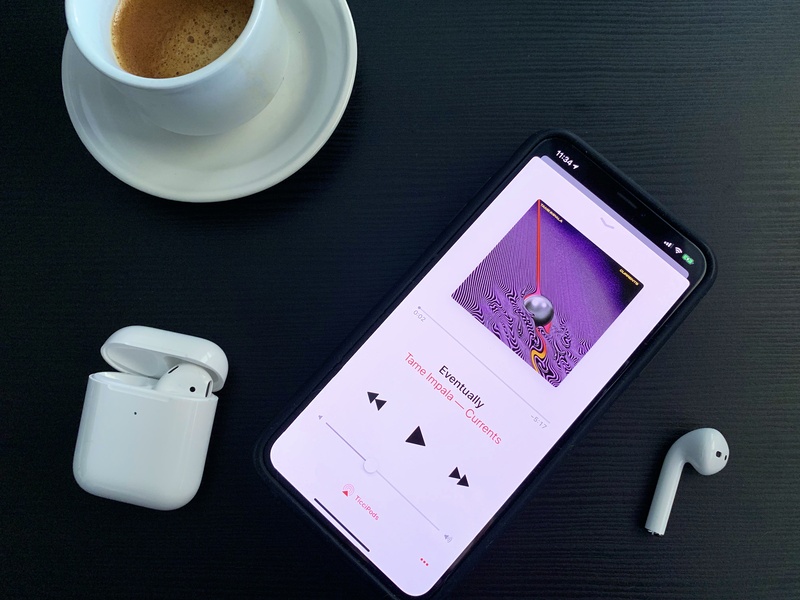 Whatever Apple has done with their new H1 chip in the AirPods, I hope to see adoption of it in more audio products from the company in the near future – starting, perhaps, with proper over-ear headphones. When you write about technology long enough – and I should know this, given that this very website turns 10 next month – it's easy to let an undercurrent of cynicism color your every opinion about tech products you're writing about. I get it – more than ever, corporations like Apple should be held accountable for their impact on our society and economy, and it's our job as reporters, writers, and podcasters to critique the minutiae of their decisions. I say this as the person who writes an annual essay about a mobile operating system that dissects APIs and developer frameworks. It's easy to be swept up in criticism at all costs. I want to remind myself, and by extension MacStories readers, that it's okay to appreciate a product for what it is and be enthusiastic about it when it's delivered to consumers in a way that transcends spec sheets and console war-style debates. The new AirPods are such a product. Just like the Apple Watch, despite the fact that they've been out for years now, AirPods still feel like a marvel of technological advancement that, more often than not, bring the word "magic" to mind. They're tiny wearable computers that can play music in your ears without wires, that have an inbuilt smart assistant, and stay with you during workouts or dance rehearsals, and that can be recharged by dropping them in a small plastic case which, somehow, now charges when it's placed on top of a mat. Even though the cynic might note that, well, actually, none of this is a technical mystery, and even though we'll probably be arguing with each other about what Apple should add to AirPods a year from now, today I just want to think of the fact that I can go for a walk wearing a wrist computer and two in-ear computers that go on the Internet, keep me company with music, and keep me in touch with other people in my life. The new AirPods are a substantial improvement over the first generation in every regard. But for once, I just want to consider how they still feel like little bits of everyday magic.